That’s good news, it was inadvertent and not by design. I can confirm that I for one can no longer see the Sponsored Update campaign results of more than a dozen investment companies and other firms, as I described below. But I still have questions regarding the visibility of the data, how it became visible and, ultimately, what sorts of protections and monitoring that LinkedIn has in place. Without a better understanding of LinkedIn’s controls, advertisers’ interest may very well cool. When I hear more, I’ll update the post. I’m doing this piecemeal because my email goes out at 3CDT and this first update should be in place, at the minimum. Something happened on LinkedIn this week (is still happening as of this posting Thursday morning) that serves as a fresh reminder about the hazards of relying on others’ ever-evolving platforms. On Tuesday, while in the process of working on a client’s competitive review, I noticed that LinkedIn was showing the results of firms’ advertising campaigns—the impressions, clicks, interactions, followers acquired and engagement rate of sponsored updates. I was dumbfounded. To give you an idea, below I show a J.P. Morgan update, one of the best-performing updates in the samples I reviewed and off-point for mutual fund and exchange-traded fund (ETF) firms. On the company page, the shaded sponsored update campaign results (under the heading "Gained from Sponsoring") appear to be a show/hide module. I would have assumed its display would be driven by the account login—only those with admin access to the company page should be able to see results for only their own campaigns. When I first realized what I was seeing, I'll admit that I made a beeline to check out the BlackRock company page. LinkedIn has singled BlackRock out for its sponsored update success (see a related post), and I wanted to see the data for myself. Curiously, no data could be seen in most of the BlackRock campaign results modules. As shown in the example below from 10 months ago, the campaign name (revealing the target audience) and elements displayed but with zeros where the data would be. That can't be right. Also new to me Tuesday: Each company update that hasn’t been sponsored has a "Sponsor update" button that opens to a sponsored update promotion. That seems odd to show to all, given that only the company can sponsor an update on its own page. From time to time, I use my clients' logins to access their LinkedIn analytics. Thinking that my use of multiple logins may have somehow confused things, I cleared my cache but still saw the data. Then I asked several others to tell me whether they could see what I was seeing. Most logged-in desktop or laptop Chrome or Internet Explorer browser-users could. The one who couldn’t see the data was accessing LinkedIn via Safari on a MacBook Air. Investment companies were my focus, but I also found that I could see the campaign data from companies not in the financial services space, too. If you work for one of these firms, I'd reach out to your LinkedIn account manager and demand to know what the heck is going on. The question for LinkedIn: Is the publication of this data by design or by accident? I’d sent a tweet about my discovery Tuesday and then an email to LinkedIn’s press account Tuesday evening but have yet to receive a response. I’ve been checking Twitter and Google search results for any official or unofficial commentary on this. So far, crickets. When and if I hear from LinkedIn, I’ll update this post. My expectation (and hope) is that this is a programming glitch that will be promptly addressed. In the absence of a credible explanation from LinkedIn, I find this breach and its persistence for most of a week to be unacceptable and inexcusable. Shouldn't somebody be paying closer attention? What About Protections For The Advertiser? Sponsored updates are an important source of revenue for LinkedIn. They drove almost half of the Marketing Solutions' $140 million quarterly revenue, which was up by more than double since July 2014, according to the company's July 30, 2015, earnings announcement. There is every intention to build on that, and the financial services vertical has been one of the areas of sales (and content) focus. Let’s proceed with the assumption that showing others’ campaign data is not how LinkedIn expects to drive sponsored update adoption. This episode nonetheless is a teachable moment for all of us increasingly intrigued by the possibilities of using social platforms to more effectively reach audiences. If you’ve ever used a social network for any length of time, you’re likely to have been surprised by changes it’s made. Facebook is notorious for this but every platform—and especially the public companies under pressure to demonstrate growth in usage and revenue—will change things up without notice. And, that has frequently included the exposure of additional data. While most of these surprises have affected individuals, brands and companies acting as content publishers have been caught unaware and needed to scramble. I submit that advertising on these platforms raises the stakes, for both platform provider and the brand willing to commit a piece of its advertising budget. Social networks are disruptive by definition. They don’t necessarily play by existing rules. As I thought about seeing all that campaign data this week, I wondered whether advertisers may be making assumptions that those running the social platforms either don’t share or aren’t aware of. What assurances have been extended—more to the point, where is it written—that campaign results aren't something to tinker with by publishing or otherwise sharing? By now, and through some trial and error, the networks have learned the importance of safeguarding personal data. But how much vetting has been done by advertisers to understand the steps that are taken to make certain that competitors don’t see one another’s marketing response data? How seriously do LinkedIn, Twitter and Facebook et al take the need to protect their advertisers, for some of whom advertising effectiveness is a leading indicator of their business results? We have all been impressed by what the social networks say they can do. Their targeting capabilities and the level of reporting available surpasses what’s available from traditional media sites. They've been compelling enough to command significant sums for pricey products. This episode makes it obvious that we need to broaden the sales discussion to explicitly communicate what we require new marketing partners to do, and to confirm that platform and advertiser are aligned on the importance of keeping campaign results private. It’s been a year when 1)the U.S. job market overall has improved and 2)we’ve heard a lot about Silicon Valley’s interest in otherwise Wall Street-bound finance types. Seven months in, let’s talk about you. What’s the 2015 market demand for what you do? This post is inspired by this week's excellent, uplifting Moz post that detailed the growing demand for digital marketers, content marketers and social media marketers. It led me to wonder about the environment for mutual fund and exchange-traded fund (ETF) marketers ready to make a change. This was going to be a feel-good post, I was sure of it. And then things went south. First I turned to LinkedIn’s database, which enables the quickest, most targeted inquiry of jobs within an industry. Below are the results of an advanced search this week of “digital marketing” positions in the investment management industry. Wait, 19 positions in all of the United States? A search without the quotation marks around digital marketing produces 100 results nationwide but then you pick up positions that simply have a marketing component (e.g., relationship manager, business analyst, fulfillment coordinator). Maybe go broader than digital? But no, then the number of results for “ETF marketing” (7) and “mutual fund marketing” (4) shrinks. And there's some overlap in those. Again, dropping the quotes produces more results but few of the new results are on-point. This was a surprise. Maybe it’s just a slow week on LinkedIn? I skeddadled over to the Indeed Job Trends search to see what could be learned from hiring trends over time. OK, clearing my throat, this is not what I expected to see at all—especially considering the expansion underway of ETF business lines. But hang in there, a click on the Indeed jobs link produces 77 results that include the LinkedIn jobs and others. Well, that's more than 19. Otherwise, you just missed the 2010 hiring boom by about five years. Do we dare look at the mutual fund marketing results? Hey, it's not all bad. Yes, the postings tail off but look at the y-scale—if mutual fund marketing jobs midway into 2015 make up 0.01 of all job postings, that’s still more than the ETF marketing postings (at the risk of overstating, let's call it 0.001). This is to be expected, given that mutual funds still outnumber ETFs. Note, however, that these postings peaked mid-2007, right before the market melted down. Wait, one more search. What about financial services marketing? Maybe that’s up? A broader category with more job postings? Negatory, looks like financial services job postings have been declining since 2012. Time to suspect the Indeed Website (when in doubt, there's always that)--do their charts even know how to draw up? Yes, yes, they do, for digital marketing, content marketing and social media over the same period. The following three images are from the Moz post, using a combination of terms. The investment industry is broke and nobody can afford to hire marketers. Except that's not the case. According to the Boston Consulting Group, the asset management industry operated with 39% margins in 2014, close to the pre-crisis high of 41% and among the highest in any industry. No jobs are available because firms are fully staffed with all the marketers they need and nobody wants out. We are on the brink of a hiring boom, not visible yet but just about to break out. The industry's talent gap is the theme of a few reports I've seen this year, including one from ninetwentynine.com that specifically mentions the need for people who know fintech, big data, risk management and...social media. Job postings, or maybe just LinkedIn and Indeed job postings, are not a reliable indicator of demand. Is it possible that all recruiting for this discipline in this sector defies hiring trends elsewhere and is predominantly conducted offline or via private LinkedIn connecting? Are most available marketing jobs executive search-level, too senior to post on Websites? What am I, or the data above, missing about the job market for mutual fund and ETF marketers? As always, I’d love to hear your thoughts, whether via comments below or privately via email. Pull up a seat to one of the more captivating online brand-to-brand exchanges we’ve been in a position to witness in the investment industry. Although the interaction happening this week between Charles Schwab and Wealthfront is fascinating on many levels, I’ll limit this post to just observations on the decisions underlying the digital communications. RIABiz, InvestmentNews and plenty of others will keep you up to date on the substance. This evolving communications case study has to do with the emergence of robo-advisor services and controversy surrounding their claims. But, there’s potential for plenty of other contentious discussion this year (can you say smart beta?) that hits even closer to home for mutual fund and exchange-traded fund (ETF) firms. So much of investment communications is planned, scripted and timed, leading marketers to believe that they have things under control. My question for you, prompted by the interactions discussed below: To what extent do your communications plans anticipate not just what you have to say but how others might respond? Early on, firms may have been apprehensive about chaotic social platforms filled with trolls waiting to take money managers on. Thankfully, that hasn’t materialized. Instead, what we are increasingly seeing are informed commentators, including product and distribution competitors as well as financial advisors themselves, publishing thoughtful counterpoints and challenges on their own blogs and content platforms. Asset managers know they need to respond to the random tweet. That's so 2012. But a precious few are 1)demonstrating that they’re paying attention to what’s being blogged about 2)posting a response, whether on their own blogs or in a comment to the original posts. Blog posts can be forever. Whatever stance your firm takes—to acknowledge, respond, ignore or be ignorant of them—will have consequences. The saga playing out this week may help frame your firm’s preparedness, including where, when, how and to whom to respond. 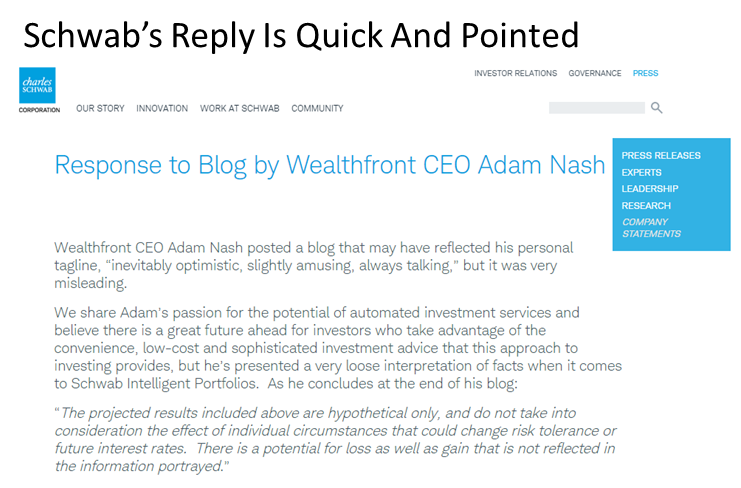 “Charles Schwab has become Merrill Lynch,” writes Nash, not intending it as a compliment.Less than 24 hours later, Schwab published what RIABiz described as a “rapid-response-counter-punch” reply to Wealthfront’s response. The piece called out Nash's "very loose interpretation of facts" and presented a three-point clarification. What follows is what this geek noticed and wondered about as all this interaction was taking place online. This is not to take away from the import of its message. It’s to acknowledge that Nash’s fast-acting response assured that his perspective would be part of the conversation at the precise moment when Schwab would be getting attention. Nash successfully grabbed some of that attention for his view and business. What helped this succeed: A strong value proposition (there’s no time to crystallize your story when news is breaking), compelling visual assets (including two borrowed from Schwab—ouch!) and Twitter followers/supporters. This program has been in the works for a while, and Nash was prepared for the announcement. Most of the readers of this blog will be in Schwab’s position. Although once a challenger itself, Schwab today has almost $2.5 trillion in assets. Count on the fact that this launch (big and good news from the company’s perspective) was carefully orchestrated, including a national online, print and television advertising campaign, media outreach and finely crafted talking points. Yet within hours, a single blog post from the CEO of a firm that manages $2 billion (gained in three years) became part of the story and threatened to disrupt the best laid plans. Did offense need to switch to defense? One can only imagine the drill that took place within Schwab’s communications team. For starters, how did they hear about the post—via their social media monitoring or did they get a heads-up? At the center of the discussions must have been this: “Do we dignify the post with a response?” The implication being that acknowledging the post could call more attention to it. The first mention I saw of Adam Nash’s blog post was in a Schwab tweet. 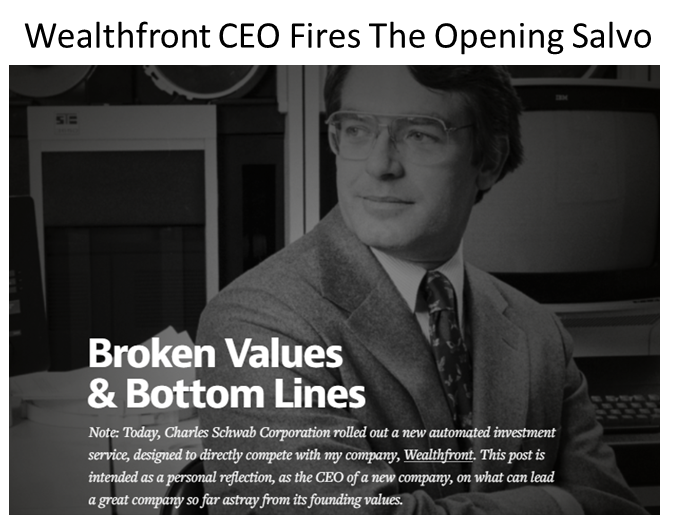 To read the post, I naturally headed to the Wealthfront blog—where there was no sign of what Wealthfront’s CEO said. That’s because the post was published under Nash’s byline on Medium.com. Interesting. I assumed that a calculation was made to go where there was a larger absolute audience, probably to position the topic at a higher level than one company CEO griping about another company’s strategy. In fact, RIABiz reported that Nash’s “blog offensive is being waged on a personal level, which is why it appeared on his own blog..." Nash's blog, yes, but on another company's domain. Understood, and maybe there were compliance issues to consider, too. But there will be those who will come to Wealthfront’s site, looking for the post, and they will be lost. Conversely, those who go to the Medium post won’t see anything else about Wealthfront’s services. And, to make the point that any digital marketer would, the decision to use Medium results in a surrender of Wealthfront.com attention, site traffic and analytics. Links, especially from authoritative sites, still have value. And yet all the linking to Nash’s post on Medium will help lift Wealthfront’s search visibility not at all. Medium does make some viewer stats available but they’re not as robust as what Wealthfront would get from its own Google Analytics. A Google search Wednesday for “Adam Nash Schwab blog post” required the searcher to hop over the Schwab response to Nash’s post (which doesn’t contain a link to it). Compare the page titles and URLs used for the posts for a partial explanation of Schwab’s higher ranking—that and the fact that Google results favor better-trafficked Websites. Schwab is unusual in that it already maintains a section of its Website for Company Statements “in response to timely news and topics of interest. Statements are generally removed from this site after one year.” This is where it chose to publish its all-text response to Nash. A few tweets have made some generational references to the old school way in which Schwab responded—via “a press statement” that used double spaces between sentences (really!). While much of the response is straightforward, it lets itself condescend in a few spots. I wonder how much thought was given to referring to Nash as “Adam” inasmuch as the response ostensibly came from the company and not an individual. There’s no provision for comments on the Company Statements pages, which is unfortunate given the statement's closing line: "We encourage transparency and dialogue and that is why we encourage investors to learn more at intelligent.schwab.com and review the facts." Did Schwab consider commenting on the Medium post, as well, I wonder? As is, both firms have taken to their own corners to comment, leaving readers to their own devices in piecing the commentaries together. Having published their respective messages, Nash and Schwab then took to Twitter (only) to make sure the word got out. The first tweet flew from Nash’s own account but soon the Wealthfront account also was pressed into action, to drive traffic to the Medium post as well as retweet supporting tweets of which there were many. You and I don’t know the total traffic to either post. From the sharing data counted by BuzzSumo, it looks as if the sharing done of Nash’s post through Wednesday far outpaced the sharing of the one-day older Schwab rebuttal. Note that the Nash post was shared on LinkedIn and Facebook, too. By Wednesday, Bitly reported about 2,900 clicks on bitly links to Nash’s post, and traffic to non-shortened links would be additional. As of Wednesday, the @CharlesSchwab Twitter account (the @Schwab4RIAs account has not been involved) had not sent a mass distribution tweet with a link to its company statement. This seems to have been an effort to “contain” the discussion. However, Schwab reached out to Twitter accounts who tweeted about the Nash post. Specifically, through Wednesday it sent 15 individually addressed tweets (tweets that start with the @accountname, limiting the reach of the tweet to only mutual followers of both accounts). You can see the tweets under the Tweets & Replies Tab of the account. It's possible that Schwab’s original communication plan included influencer marketing, which involves brands reaching out to identified influencers with the hope that the offer of early information or special access will yield positive coverage. But these individually addressed tweets were not that. An account that tweeted about the Nash post is not likely to be open to any kind of perceived “manipulation” on Schwab’s part, not at that point. As stated, the purpose was to make sure that the account saw Schwab’s side of the debate. Many of the accounts tweeted to in fact belong to those influential in the space, including Josh Brown, Michael Kitces and Paul Kedrosky. The net effect of that for those who follow these influencers is that multiple identical Schwab tweets showed up in the Twitter stream. A series of Schwab tweets is what first caught my attention. Did the target account even click on the link? Better yet, did the target account retweet it, as many might feel obliged to do if they’d previously tweeted about Nash’s post? How many clicks did each attract? Because Schwab provided each Twitter account with a unique shortened link (bitly), bystanders can see the effect of the outreach by account. Just by adding a plus sign to each bitly, we can get a look at where the outreach worked best. Through Wednesday, it looks as if there were nearly 1,500 total clicks to the page. 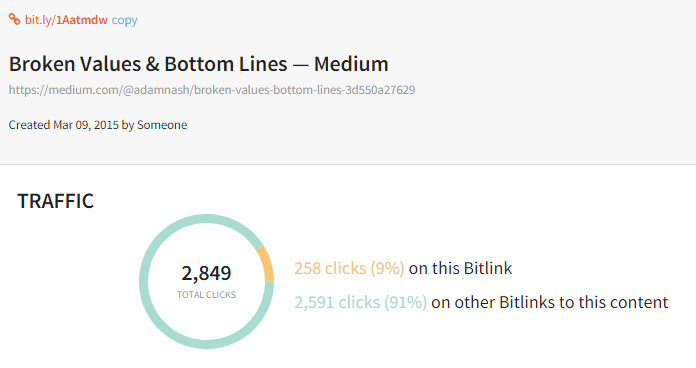 Two bitlys were tweeted to The @ReformedBroker (Josh Brown), and together they drove almost 900 clicks or 60% of all. The most effective tweet is shown below. By comparison, the bitly link to the press release announcing the Intelligent Portfolios attracted 118 clicks. Of course, there's no doubt Schwab is collecting more data on its outreach than we have access to. How to wrap this up? It can't be done, it's too soon. Can we agree to just adjourn? Join me in watching how the substance of the debate unfolds and—particularly relevant for communicators—where and how it takes place. If nothing else, the jockeying by these two firms is demonstrating the importance of real-time listening, reacting and acting. Maybe not on this scale or at this emotional pitch, but it’s reasonable to expect that your firm will be the subject of online discourse at some unknowable point. It’s an eventuality that cool heads, including those belonging to digital marketers, need to prepare for.